Back to school. Time to start being responsible(ish) again. Sigh. I’m not sure if I’m a Tiger Mom or a Sloth Mom or a Shark Mom or an Exotic Albino Sandflea Mom or what. Honestly, I don’t know what in the name of Athena’s flashcards I’m doing most of the time. (Which is why I almost never write about parenting here.) I just try to apply some method to the madness, focus on what might be the most important values, and hope I’m not doing anything that makes these little people decide to be strippers or bounty hunters or mimes when they grow up. It’s kind of our mantra, I guess. Q: If something is hard to do, is that a reason not to do it? A: Nope. That’s a reason to be extra proud after we’ve done it. Q: What if we’re afraid we won’t be good at something? A: Don’t think about being good at it. Think of it as trying something new. Q: Do we choose to do something or not do something because we worry people will talk about us? A: No. People will always talk. We can at least give them something interesting to talk about. Q: Do we have to be the best at everything? Q: Do we have to do our best at everything? Q: Do we ever do something that will hurt someone else? Q: Do we ever take or break something belonging to someone else? Q: If we do, by accident or on purpose, harm someone else’s body, feelings, or property, what’s the first and most important thing to say? Q: What do we do if we see someone who has nobody to play with, sit with, or talk to? A: Play with them. Sit with them. Talk to them. Q: What do we say to every teacher and staff person we see? Q: Do we ever make fun of our own sibling at school? A: No. Save that for home. Just kidding. Q: Do we tell the truth? Q: Do we do anything on purpose that could result in our own serious injury? Q: Does every single thing that pops into our head need to be said out loud at the moment we think it? Q: Do we say or do something just because we heard it on TV, saw it on YouTube, or read it in a book? A: No. This is real life. Q: What about cutting holes in our school clothes with scissors like that time ONE OF YOU CAME HOME WITHOUT THE LEGS OF YOUR PANTS — is that a good idea? Q: Do we do anything AT ALL involving comedy and a toilet? And so: If you do decide to be a stripper, a bounty hunter, or a mime — be a brave stripper; a kind bounty hunter; a wise mime. Do your best, always. BE BRAVE. BE KIND. BE WISE. You got this, kids. Go get ‘em. Maybe cross out the thing about the strippers and bounty hunters. Not a mom, but am going to share with the legions of moms I know..and also the legions of humans I know. Good human-type advice and a great way to start my day. Thanks! I often wake up thinking “not a mom,” then open my eyes and see these little hungry people standing there and remember: Oh yeah. I’m a parent. Now what am I gonna do? I love this. Thank you. Love, love this. Am going to share it with my family. Maybe turn it in to a poster. Maybe cross out the parts about the stripper and the bounty hunter, though? This is perfect. For the record, I’m a sloth mom. Is that a real thing because I feel like we should start a club. Seriously though, I love these lessons. Can I send you a 28-year old kid who never got them so you can pound them into him? Emphasis on the pound if need be. I KNOW you were a brave and kind and wise stripper, too. That’s awesome. I’ve always suspected I could make a good living stripping. I’d have a killer soundtrack. And I think people would pay a whoooooole lot of money to get me to put my clothes back on. I love that your kid cut his/her pants. why didn’t I think of that when I was a kid? Sometimes, you’re wearing pants, but you just really need to be wearing shorts. Right that very second. The interesting thing is that sometimes it takes wisdom to know what the kind thing is and bravery to be able to do it. Thanks for taking the time to focus on such important values with your little people. 😉 You’re alright by me, chica! “sometimes it takes wisdom to know what the kind thing is and bravery to be able to do it.” — I’m going to paper my walls with THAT. Well, you totally had me until the “comedy and a toilet part.” 🙂 Seriously though, I wish you WOULD write more about parenting because you sure have some wonderful words of wisdom. Loved this! Oh, thank you! The “comedy and a toilet” part comes from a number of episodes involving flushing items that weren’t meant to be flushed. It’s hard for a kid to resist the laughs he (or she) can get from that. Oh my gosh I love this. Since school starts Monday and so many things are already starting to run through my head that are freaking me out about having both kids in high school this year, this post that I am re-blogging is timely. Even though I think she has kids that are younger, all of these things still apply, some of them even more so. Many of these things I wish more people taught their kids. 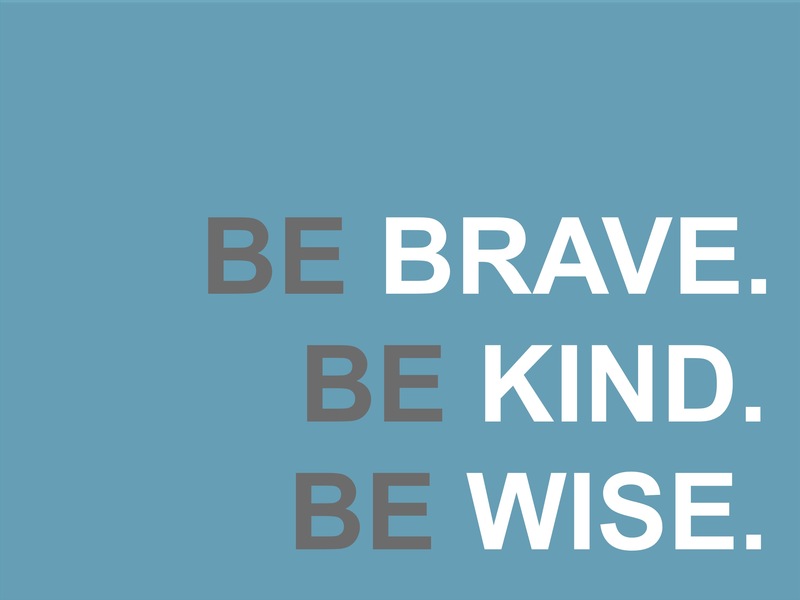 Especially the parts about being kind and brave. PS: check out her penguins too. OMG, this is one of my favorites of all your many great posts. If every parent had these sorts of conversations, it would send positive ripples through schoolyards, companies, countries…. My daughter is a second-grade teacher. I’m going to give this to her to share with her kiddos’ parents. Thank you so much! And I’m in awe of your daughter and all teachers. I couldn’t do it. It takes a special kind of patience-fortified DNA that I DO NOT have. Not even a little. Printing this as I type. To be read aloud at dinner tonight. Love! So awesome! I love how you included the call and response Q&A too. You’ve inspired me to pick up this mantra with my kids. Just pinned and tweeted!